The media strategy presented to Director-General Mayor on 21/23 July 1998 proposed a "quantitative objective" to collect the personal engagement of the largest number of individuals possible on the planet to pass from a culture of war and violence to a culture of peace and non-violence. This originated in the dialogue between Enzo Fazzino and Philippe Gilleron called PLANET 2100 based on the Planet Society project and it was further elaborated in the "sensibilization strategy" that we sent the Director-General on 7 October 1998. Rather than trying to make an official UNESCO document, which would have had to pass through the Executive Board and General Conference and probably resulted in "heavy" diplomatic language, we worked with Pierre Marchand to develop a statement by the Nobel Peace Laureates. Mr Marchand, the founder and director of the French NGO Partage avec les Enfants du Monde, had brought a visiting group of Partage activists to UNESCO on 30 September 1998. During the course of my dialogue with them, a participant from Nepal suggested that we disseminate a simple statement that could be signed by individuals committing themselves to practice a culture of peace in their daily lives. Afterwards, Mr Marchand agreed that he would develop such a statement in coordination with the Nobel Peace Laureates and present it to UNESCO. The statement was submitted to Director-General Mayor on 20 November 1998, modified slightly, and given for its first signatures to several Nobel Laureates attending the ceremony on 8 December for the anniversary of the Universal Declaration of Human Rights at UNESCO. The Manifesto was deliberately kept as simple as possible (click here to read it). The Manifesto was formally launched at a Press Conference 4 March 1999 at the Eiffel Tower in Paris, with the participation of three Nobel Prizes Laureates that first signed the text : Mairead Corrigan Maguire (Northern Ireland), Rigoberta Menchu Tum (Guatemala) and Adolfo Perez Esquivel (Argentina) in the presence of UNESCO Director-General Federico Mayor and other famous personalities. The largest number of signatures, almost half of the total, were gathered by the Brahma Kumaris World Spiritual University, including 35 million in India, over 1 million in Nepal and another million from many other countries including Brazil, Malaysia and the Philippines. Details of where these signatures came from are available on the UNESCO Culture of Peace Website In recognition of their achievement, I undertook a mission to India 27 November 2000 and took part in a press conference and a public event with them along with high government officials and representatives of UNESCO and the United Nations. 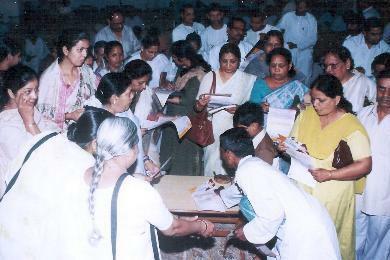 The method they used, one-on-one encounters to discuss the principles of the Manifesto 2000 with people in public places throughout India, can be considered as exemplary for the development of the global movement, as described in a documentation that they provided as of September 21, 2000. 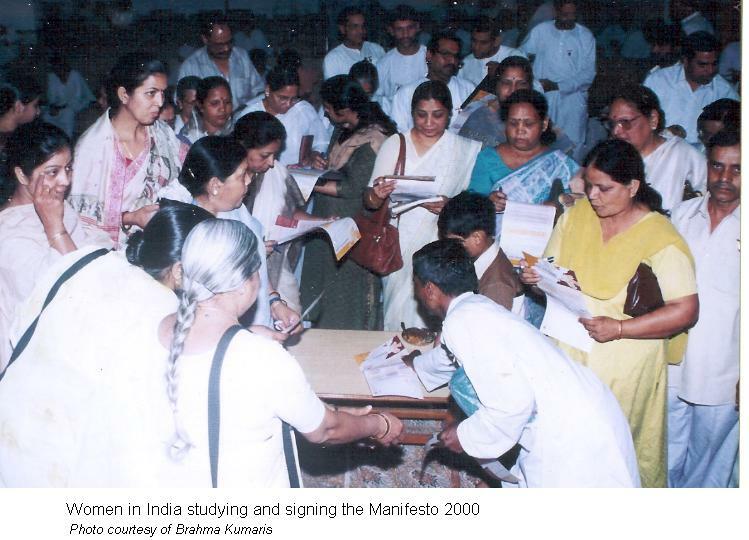 Women in India studying and signing the Manifesto 2000. Photo courtesy of Brahma Kumaris.